On 30 June 1768, 250 years ago today, the Massachusetts House and Gov. Francis Bernard finally had their showdown over the Circular Letter to other colonies’ legislatures. I went early to the Council to watch the Proceedings of the House, having been informed that they intended to originate an Invitation for another Congress [like the Stamp Act Congress]: In which Case the Moment I got Intelligence of it I intended to dissolve them. The representatives actually started the day with a few housekeeping items, certifying financial accounts and putting off petitions to a future session—preparing for the body to be dissolved. Only then did they turn to the royal government’s demand that they rescind the Circular Letter. The House cleared the gallery of spectators, informed the Council they were going into debate, and told the doorkeeper not to call out any members or bring in any messages. A committee led by Samuel Adams and James Otis, Jr., presented the drafts of replies to the governor and Secretary of State. The letter to Bernard is four pages long in the legislative record. The letter to Hillsborough, written for the signature of speaker of the house Thomas Cushing, is five and a half pages. Clearly those documents had been in the works for days as the House handled other business and stalled for time. After the letter to Hillsborough was read twice, and perhaps tweaked, the legislators voted 92–13 to accept it. Then the House was asked whether it would rescind the Circular Letter, as London had ordered. Again, 92 representatives defied the royal orders, and only 17 voted to rescind. This was one of the rare “roll call votes” in the colonial House with every legislator’s choice recorded and published. Bernard complained, “among the Majority were many Members who were scarce ever known upon any other Occasion to vote against the Government Side of a Question; so greatly has infatuation and intimidation gained Ground.” Clearly legislators thought that defiance would be popular with voters. And the House wasn’t done. It then appointed Adams, Otis, Jerathmeel Bowers, Col. James Otis, and John Hancock to draft a petition “praying that His Majesty would be graciously pleased to remove his Excellency Francis Bernard, Esq; from the Government of this Province.” The vote on that motion was not recorded, and Bernard said it “was carried by a Majority of 5” only. But what a surprise! Adams had a two-page draft of that petition ready to go. Rather than immediately dissolve the legislature, Gov. Bernard decided to wait until he had officially received the House’s response. He felt confident that this new committee wouldn’t be able “to cook up something” to present as an impeachable offense. Indeed, after some debate the House asked Adams and colleagues to “bring in the Evidence in Support” of their charges. as soon as the House entered one of the Committee of the Council expostulated with me upon my calling up the House while the Council was proceeding on the Address and was so indecent as to appeal to the House. I silenced him: another Gentleman interposed; I stopt him also, and proceeded to the Prorogation. The governor informed the assembled legislators which of the bills approved by both chambers of the General Court in the legislative session he had approved. Then secretary Andrew Oliver announced that Gov. Bernard prorogued the House, sending all the representatives home. At the end of the workday on 28 June 1768, Gov. Francis Bernard demanded that the Massachusetts House respond to his week-old message about their Circular Letter to other colonial legislatures. The Crown—meaning Secretary of State Hillsborough speaking for the British government in the voice of King George III—was requiring that the House rescind that letter or the governor would dissolve the legislature for the year. The House responded with the tested tactic of stalling for time. First they said they’d discuss the question at 10:00 A.M. the next morning—250 years ago today. On that Wednesday morning, the legislators discussed a bridge in Westford, clarifying the province’s benefit of clergy law, burning old government securities, and their own attendance and travel records (so they could be reimbursed). The representatives considered this question: “Whether the House will at this Time order a Tax-Bill?” The House voted no, 54 to 46. You may recall that Gov. Bernard was hoping the prospect of such a bill lowering voters’ taxes would be his leverage over the legislature, but the representatives narrowly took that off the table. The House sent me a Message desiring me to grant them a Recess that they might consult their Constituents respecting the Requisition. I knew that such an Indulgence would be liable to great Abuse; but if I had thought it could have produced any good Effect, which I had not any Reason to expect, I did not think myself at Liberty to postpone the Consideration of this important Question. I therefore returned an immediate Answer that I could not consistently with my Sense of my Duty prorogue or adjourn the Court untill I had received an Answer. The committee sent to the governor to ask this favor didn’t include any of the House’s Whig firebrands. In fact, those designated members might have been on the fence, most eager to consult with their neighbors. But Bernard didn’t relent. The House then adjourn’d till To-morrow Morning at Eight o’Clock, the Members bring first enjoin’d to attend punctually. TOMORROW: Can’t put it off any longer. On 21 June 1768, as quoted back here, Gov. Francis Bernard passed on the instructions from the Earl of Hillsborough, Secretary of State, that the Massachusetts House had to rescind its Circular Letter to other colonial legislatures. Bernard didn’t think that would turn out well. All he heard over the next few days indicated that the legislators were preparing “the very reverse of disavowing the Proceedings of the late House.” He watched the action as closely as he could, ready to dissolve the General Court if it took steps to call another congress of colonies or something else radical. Meanwhile, there was more fallout from the Liberty riot on 10 June. The town had calmed down after the big town meeting on 14 June, but that was because the Commissioners of Customs were out of sight and reach at Castle William. What Steps the Governor and Council may take we cannot tell, but having applied to them, we have received no Assurances of Protection, and we are persuaded the Governor will not apply for Troops without the Advice of his Council, which Measure We do not imagine they will recommend, and we now write, Sir, to acquaint your Excellency of the very alarming State of things at Boston, and leave it to your Judgement to act as you shall think proper for the Honour of the Crown and protection of its Servants here in the present Exigency. As I have received no Letter from you on this Subject or any Requisition made by you, for the Aid and Assistance of His Majesty’s Forces on this Occasion; I have not ordered any Troops to move into your Province. Nor do I think it proper to order any of His Majesty’s Forces to march for the sole purpose of quelling a Riot; unless required thereto, by the Civil Power. You must be the best Judge of the situation of Affairs in your Government, and whether the Aid of Troops is wanted to enforce the Laws, and to preserve Peace and Tranquility in the City. The moment you shall judge it convenient to apply to me for the Assistance of the King’s forces, I shall order such a number to march as you shall have occasion for. But Bernard didn’t want to act unilaterally. He wanted the Massachusetts Council, or some members of it, to endorse any call for military support. He wanted Gen. Gage to perceive the situation as an emergency and send regiments. But he didn’t want to be the one man blamed for bringing in soldiers. I have heretofore in times of great Danger put the question to the Council whether I should apply to the General for troops, & have received such answers as have convinced me that it is in vain ever to put that question again. And yet upon the late tumults I told the Council that I was ready to put the question for applying to the General for troops if Any two of them would propose it. I was answered that they did not desire to be knocked on the head. I told them that I did not desire it neither; but I was ready to take my share of the danger with them, and if they would advise this Measure I would carry it into Execution. But I would not act solely in this & take the whole resentment upon myself, attended with a charge of acting unconstitutionally in not taking the Advice of the Council. . . . Above a fortnight ago A Committee of both houses was appointed [the House chose its committee members on 18 June] to enquire into the foundation of a report that troops were coming hither. A Sub-committee was sent to me, who after Apologising for the question asked me if I had, or any one that I knew had applied for troops to come hither. I accepted the apology being desirous & prepared to answer the question. I told them that I neither had myself nor did I know that any one else had applied for troops; but that I was certain that troops would come here, not from any knowledge of applications or orders, but from the sure consequence of effects from Causes; and I beleived that when they did come, it would be Very satisfactory to most people of property in the Town, tho’ perhaps, they won’t own it. 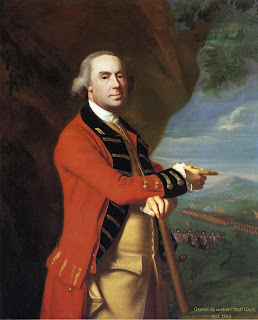 That for my own part I avoided as much as possible having Any hand in or knowledge of it: for if I wanted to have Troops here, I need not expose myself by Applying for them; the Sons of Liberty would save me that trouble. Thus, the possibility of a military force in Boston—beyond H.M.S. Romney, already assisting the Customs office and protecting its staff—was hanging in the air as the summer began. It is now a full Week since I laid before you his Majesty’s Requisition, signified by his Secretary of State: I must therefore desire you to come to a Resolution upon it, for I cannot admit of a much longer Delay, without considering it as an Answer in the Negative. The House resolved to deal with that question the next morning at 10:00. TOMORROW: A play for more time? You may have noticed how in all these postings about the Massachusetts House’s Circular Letter of 1768, quoting politicians on the circular letter and on the debate over the circular letter, I’ve never actually quoted the circular letter. …considering the utter impracticability of their being fully & equally represented in Parliament, and the great Expence that must unavoidably attend even a partial Representation there; this House think that a Taxation of their Constituents even without their consent, grievous as it is would be preferable to any Representation that could be admitted for them there. It’s possible that the first draft reported out of committee and voted down on 21 Jan 1768 was more confrontational in its language or proposals than the final text. Gov. Bernard reported that opponents of that draft argued that it “would be considered at home [i.e., in Britain] as appointing another congress” like the Stamp Act Congress of 1765. Which hadn’t actually accomplished much, but was seen as radical. The only action the circular letter ended up proposing was that each colony’s legislature petition the Crown using the same arguments. As a result, the responses from other colonies to the Massachusetts House were positive but bland and pointed to no further action. What turned the circular letter into the Circular Letter was the Earl of Hillsborough’s response to it in April. As a new Secretary of State, he wanted to strengthen the authority of the imperial government over the North American colonies. He interpreted Bernard’s reports on the Massachusetts legislature as even worse than they were. He didn’t think he could just ignore this document. Once Hillsborough demanded that the Massachusetts House rescind the letter, however, he moved the argument beyond what would be a fair system of taxation in a worldwide empire. He turned the conflict into one over whether the Crown could compel some of its North American subjects into abjuring their established speech and principles. 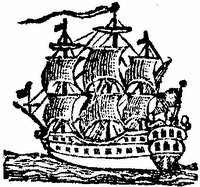 On 29 Feb 1768, as I described yesterday, the passengers on the Abigail finally made it to solid ground in Boston after a terrible fourteen-week voyage from London. Among those passengers was a new Customs officer named Thomas Irving, who carried a letter of introduction to Gov. Francis Bernard. The economic historian John McCusker reports that letter was dated 23 Oct 1767 and marked as received on Sunday, 30 Jan 1768, which gives us a benchmark for other letters that may have traveled on the Abigail. The Speaker [Thomas Cushing] communicated a Letter from Dennys DeBerdt, Esq; which was read and communicated for Consideration to Mr. Speaker, Capt. [Edward] Sheaffe, and Brigadier [Timothy] Ruggles. The Colonial Society of Massachusetts published a set of DeBerdt’s letters in 1911. One of those was dated 21 Oct 1767, shortly before the Abigail set sail, and addressed to Whig legislator Edward Sheaffe of Charlestown, appointed to the committee to reply. It’s possible that Cushing brought forward another letter that hasn’t survived, but this appears to be the most likely candidate. The Massachusetts Whigs had been so pleased with that assurance that London wanted their governor to act more moderate that they had the letter published in the 10 November Boston Gazette. 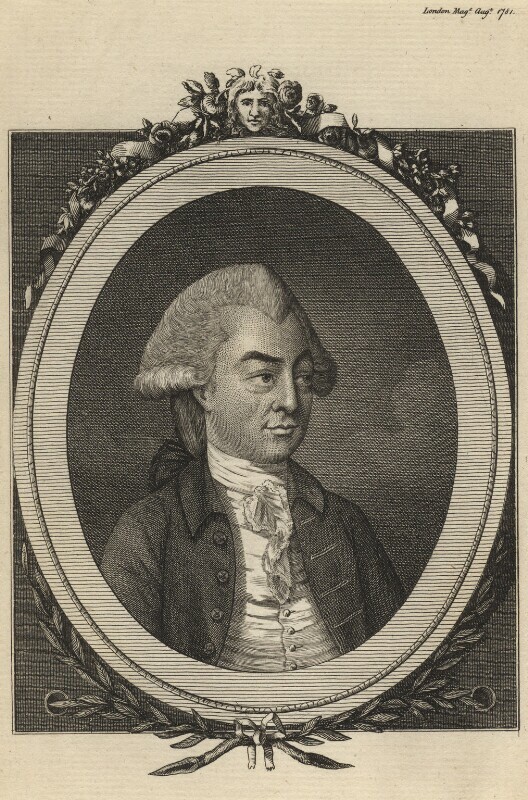 Mr. Secretary [Andrew Oliver, shown above], by Order of the Governor, came down and Read in the House a Letter from the Right Honorable the Earl of Shelburne to his Excellency [the governor], and then withdrew. I am to inform you, Sir, that it is His Majesty’s determined Resolution to extend to you His Countenance and Protection in every Constitutional Measure that shall be found necessary for the Support of His Government in the Massachusets Bay. I shall make such a prudent and proper Use of this Letter, as I hope it will restore the Peace and Tranquility of this Province, for which Purpose considerable Steps have already been made by the House of Representatives. The “prudent and proper Use of this Letter” that Bernard planned was to have Secretary Oliver read it to the House, pushing lawmakers to recognize the reality that he had the royal government behind him. That didn’t work. Instead, the very next day the House decided to repudiate its earlier vote not to send a circular letter to the other colonial legislatures. Whatever “considerable Steps” toward “Peace and Tranquility” Bernard perceived on 2 February were gone two days later. The House decided to communicate with other colonial governments, even if that did breach protocol. Furthermore, Massachusetts legislators focused on one phrase from Shelburne: “from your several Letters.” For the rest of the session, House leaders periodically asked Bernard for “a Copy of the Letter from the Right Honorable the Earl of Shelburn, lately read to the House by Order of his Excellency, and his own several Letters to which it refers.” The governor gave Cushing a copy of Shelburne’s letter but stonewalled on sharing his own, which is what the Whigs really wanted. As discussed back here, Massachusetts politicians were convinced Bernard was writing bad things about them to London. All the more reason to form a united front with other colonial legislatures! And all that time, nobody in Boston knew that the Earl of Shelburne’s opinions no longer mattered. There had been a shakeup in the British government. The Earl of Hillsborough had assumed responsibility for the North American colonies, and he was stricter than his predecessor. TOMORROW: What was so important about the February 1768 circular letter. What Prompted Reconsideration of the Circular Letter? As I described here, on 21 Jan 1768 a legislative committee steered by James Otis, Jr., and Samuel Adams proposed that the Massachusetts House send a circular letter to the other colonial legislatures. And the House voted that down. But then on 4 February, the legislators voted to reconsider. And a week later, on 11 February, they approved the text of a letter that quickly went out to the other capitals. What changed representatives’ minds before 4 February? I have a theory. The Massachusetts House records tell us that two letters from London were presented to the chamber at the beginning of that month. On 1 February, speaker of the house Thomas Cushing shared a dispatch from Dennis DeBerdt, the body’s new lobbyist. And on the 3rd, province secretary Andrew Oliver read aloud a letter that the Earl of Shelburne, Secretary of State, had written to Gov. Francis Bernard. The newspapers and Boston town records report that the brigantine Abigail, captained by James Harding Stevens, arrived late that January. That was the only ship that those sources reported had come from London since the start of the year, and possibly the only one since November. an honorary diploma from the University of Edinburgh for the Rev. Samuel Cooper, according to the 8 February Boston Evening-Post. Lt. William Haswell, retired from the Royal Navy, and his daughter, who would grow up to become the actress and novelist Susanna Rowson. Thomas Irving (called “Robert Irvine” in the newspapers), Inspector of Imports and Exports for North America, a Customs officer. three sea captains and three other mariners who worked out of Boston or the Piscataqua harbor. various craftspeople, including a saddler, a joiner, a farmer, and a spinster. The 4 February Boston News-Letter said the passengers included “a number of weavers, wool-combers, cloathiers, and other manufacturers and mechanics,” but those don’t appear on the town’s official list of arrivals. Usually a trip across the Atlantic took six weeks. The 22 Oct 1767 Boston News-Letter made special note when Capt. James Bruce “had but 4 Weeks Passage” from London. Capt. Stevens was not so lucky. The Abigail entered Boston harbor on the night of 28 Jan 1768 during a snowstorm. And it wasn’t safe yet. As the Post-Boy reported, “by the Violence of the Wind, and the Weather being extreme cold, the Vessel drove ashore on Lovel’s Island.” The ship had to be partially unloaded before it could be floated again. On that luckless brigantine, I hypothesize, came the two letters from London that were brought into the Representatives’ Chamber of the Town House early the following week. TOMORROW: Looking at the letters. On 23 June 1768, a committee from the Massachusetts General Court asked Gov. Francis Bernard for documents related to the House’s circular letter of 11 February. House members wanted the whole text of a couple of specific letters from London they had heard about—plus, as the governor wrote to his boss, Secretary of State Hillsborough, “Copies of my Letters to your Lordship upon the Subject.” Bernard recognized that as a fishing expedition. The next morning—250 years ago today—the governor sent the House a copy of the last two paragraphs of Hillsborough’s 22 April letter, which ordered him to end the legislative session if the House refused to rescind its circular letter. I should have communicated the whole of the Earl of Hillsborough’s Letter relating to the Business which I laid before you the 21st instant [i.e., of this month], if I had not been desirous that your Compliance with his Majesty’s Requisition might have its fullest Merit, by its appearing to be entirely dictated by a Sense of your Duty. But since you desire to know what my further Orders are, I hereby send you a Copy of the other Part of the Letter relative to this Business, which contains all my Instructions thereupon. And as I know you will not expect that I should disobey the King’s positive Commands, I must desire that if you shall resolve to oblige me to execute them, you will previously to your giving your final Answer, prevent the inconveniences which must fall upon the People for want of the annual Tax-Bill, which I understand is not as yet sent up to the Board [i.e., the Council]. For if I am obliged to dissolve the General Court, I shall not think myself at liberty to call another, till I receive his Majesty’s Commands for that purpose, which will be too late to prevent the Treasurer [Harrison Gray] issuing his Warrants for the whole Tax granted by the Act of last year. As to the Letter of the Earl of Hillsborough which I communicated to the Council, I must beg Leave to be the proper Judge of the time and occasion of communicating any papers I receive to the Council or the House. If I had then thought it expedient to lay it before the House, I should have then done so; when I shall think it so, I shall do it. As to your Request of Copies of my Letters to the Secretary of State, you may assure yourselves that I shall never make public my Letters to his Majesty’s Ministers, but upon my own Motion, and for my own Reasons. In sum, I didn’t show you the Crown’s orders right away because I know you dislike being made to do things. Also, you can’t make me do things. As for the “Tax-Bill,” British legislatures had leverage over the executive because they constitutionally controlled taxation and thus the funding for governmental functions. But in this case, the governor pointed out, legislators had hopes of lowering their constituents’ taxes, and to do that they had to remain in session—which meant cooperating with him, since he had the power to dissolve the General Court. I have received, and laid before the King, Your Letters to the Earl of Shelburne N[umber]s. 4. 5. & 6. with the Inclosures. That seems like an innocuous sentence, but Bernard had a strong reason to keep it hidden. With those words the Earl of Hillsborough made clear that the negative view he had of Massachusetts and its legislature was based on the information his predecessor had received from the governor. Bernard had been assuring the province’s politicians that he presented them to his superiors in the best possible light. Most local Whigs didn’t believe him, but without access to his correspondence they couldn’t prove that suspicion. That’s why they had kept asking for his letters. TOMORROW: What changed the House’s mind about the circular letter—a hypothesis. On 22 June 1768, the Massachusetts House chose a committee to respond to Gov. Francis Bernard’s transmission of the Earl of Hillsborough’s response to their circular letter. James Warren of Plymouth, an Otis in-law. Thomas Sanders of Gloucester, one of the members Gov. Bernard had vetoed from the Council the month before. it would be of great Use to them, to have before them a Copy of his Majesty’s Instructions referred to therein, the whole of Lord Hillsborough’s Letter, his Excellency’s [i.e., the governor’s] own Letters on the Occasion; and also another Letter from Lord Hillsborough to his Excellency, said to have been communicated to the honorable Board [i.e., the Council]. After the speaker called in all members, they voted to send Otis to the Council to request any letters from Hillsborough it had. Councilor William Brattle came back with the message that they had only heard province secretary Andrew Oliver read the letters to them, so they had no copies. The House then approved another committee of five to carry its request for documents to the governor. It strikes me as significant that four of that new committee’s members had military titles, and Spooner was the only overlap with the larger committee. The House didn’t give Bernard any opening to complain that this request came from unpatriotic malcontents. Since our federal Freedom of Information Act and Presidential Records Act, we have a fairly expansive expectation of getting to see government documents—eventually, at least, even if they have to be Scotch-taped back together. Back in the eighteenth century, even British governments didn’t operate so openly. Parliamentary debates weren’t regularly transcribed or published, and rare reports of speeches appeared with the members’ names disguised just in case publication turned out to be illegal. Likewise, the Massachusetts House records say nothing about the first, unsuccessful attempt to win approval for the circular letter or of Otis’s “harangue” against the royal government on 22 June. The executive branch was particularly closed. All of its members theoretically acted as one on behalf of the King and enjoyed some measure of royal privilege. That’s why the Earl of Hillsborough wrote in the name of “his Majesty” and Gov. Bernard had referred to the earl’s letter as being “his Majesty’s Instruction.” Bernard and Hillsborough considered their correspondence confidential, available to the legislature or public only on the terms they chose. But of course Gov. Bernard knew that simply refusing the House’s request to see those letters would give them something new to complain about. He faced the question of whether that would be worse than releasing them. By mid-June 1768, the Massachusetts House had received several favorable responses to the circular letter that the previous elected assembly had sent out in February. 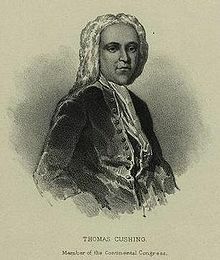 Speaker of the house Thomas Cushing’s counterparts had replied from New Hampshire (25 February), Virginia (9 May), New Jersey (9 May), South Carolina (10 June), and Connecticut (11 June), with Georgia (16 June) and Rhode Island (5 August) still to come. Of course, that list didn’t include the big colonies of New York and Pennsylvania, containing the two biggest ports in North America. They would be necessary for any united political movement against the Townshend Act. On 21 June, Gov. Francis Bernard sent the House another response to the circular letter: a message from the Earl of Hillsborough, the new Secretary of State for the colonies in London, demanding that the body retract the document. A Civil Treatment of a petition of the Town to me, a plain friendly answer thereto & some real Service by interposing with the man of war, have given me a little popularity. But it wont last a week: as soon as I have executed the orders I have just recieved from the Secretary of State, in the general Assembly, there will be an end of my popularity. And I dont know whether I shant be obliged to act like the Capt of a fireship, provide for my retreat before I light the fusee. In passing on Hillsborough’s message, Bernard told the Massachusetts assembly, “I am merely ministerial in this Business, having received his Majesty’s Instructions for all I have to do in it.” In other words, don’t blame the messenger. There were ninety-eight legislators present, clerk Samuel Adams recorded. They decided to discuss the letter the next day at 10:00 A.M. At that time, seven more members joined the body. [James] Otis made a Speech near two hours long of the most violent & virulent Nature. He abused all Persons in Authority both here and at home. He indeed excepted the Kings Person, but traduced his Government with all the Bitterness of Words. He said “that the King appointed none but Boys for his Ministers; that they had no Education but travelling thro’ France, from whence they returned full of the slavish Principles of that Country; that they knew Nothing of Business when they came into their Offices, and did not stay long enough to acquire that little Knowledge which is gained from Experience; that all Business was really done by the Clerks, & even they were too frequently changed to understand what they were about; that the People in England did not know what the Rights of Englishmen capable of composing so elegant so pure and so nervous a Writing as the Petition to the King which passed the last Session.” &c.
I give your Lordship a Specimen of this Rhapsody: and it was remarked that in this general Censure of the Kings Government No Exception was made of the Minister who favoured America by the Repeal of the Stamp-Act &amp; by other Indulgences; by the Abuse whereof this very Faction has rose to this Head [i.e., William Pitt]: All were involved in one common Obloquy. I quote these Sayings from the Mouths of those who heard them delivered in the House which was laid quite open, both Doors and Gallery, upon this Occasion. But neither they nor I can pretend to Exactness of Words; but the Substance I dare say does not vary Materially. In another Part of the Speech, he passed an Encomium upon Oliver Cromwell and extolled the Times preceeding his Advancement and particularily the Murther of the King. The Result was the appointing a Committee to take the Message &c into Consideration, which Committee consisted entirely of the most violent of the Heads of the Faction viz the Representatives of the Town of Boston & 3 of those whom I had refused to admit into the Council upon Account of their having been distinguished by their fomenting the Troubles of Government, with two others. Thus the House seemed to prejudge this Business in the Appointment of a Committee: and indeed the Appointment of a Committee at all shewed a Disposition to argue rather than submit. Yes, things weren’t looking good for a quiet, obedient retraction of the circular letter as the Earl of Hillsborough had demanded. TOMORROW: A request for documents. In February 1768, the Massachusetts House sent its soon-to-be-famous Circular Latter to other colonial legislatures. That same month, Wills Hill, the Earl of Hillsborough (shown here), took over as Secretary of State for North America. Like his predecessor, the Earl of Shelburne, Hillsborough came from the Whig faction in Parliament, but he favored stricter measures to maintain the British Empire’s central authority. He sent off a response to the Massachusetts letter in April. By the time that letter reached North America, there had been several more conflicts between Gov. Francis Bernard and the Boston Whigs. Then there was a blow-up over a Boston Gazette essay criticizing Bernard (not quite by name), written pseudonymously by Dr. Joseph Warren, as mentioned back here. The Council, full legislature, and finally a Suffolk County grand jury all gave Gov. Bernard the runaround on a libel case. In May, the province’s voters elected a new Massachusetts General Court, as I described last month. That led the governor into a confrontation with John Hancock and the Cadets. Then came the choice of Councilors. Of the seven men newly voted onto the Council, four had been members of the committee that drafted one or both forms of the circular letter. No wonder Gov. Francis Bernard vetoed all but one. June brought impressment by the Royal Navy, the Customs house seizure of Hancock’s sloop Liberty riot, the ensuing riot, and most Customs Commissioners and top employees fleeing to Castle William for their safety. Even as he tried to calm that situation on 15 June, Gov. Bernard received the Earl of Hillsborough’s letter. It gives great Concern to His Majesty to find that the same Moderation, which appeared by Your Letter (No: 3) to have been adopted at the Beginning of the Session in a full Assembly, had not continued, and that, instead of that Spirit of Prudence and Respect to the Constitution, which seemed at that Time to influence the Conduct of a large Majority of the Members, a thin House at the End of the Session should have presumed to revert to, and resolve upon, a Measure of so inflammatory a Nature, as that of writing to the Other Colonies on the Subject of their intended Representations against some late Acts of Parliament. His Majesty considers this Step as evidently tending to create unwarrantable Combinations to excite an unjustifiable Opposition to the constitutional Authority of Parliament, and to revive those unhappy Divisions and Distractions which have operated so prejudicially to the true Interests of Great Britain and the Colonies. After what passed in the former Part of the Session, and after the declared Sense of so large a Majority, when the House was full, His Majesty cannot but consider this as a very unfair Proceeding, and the Resolutions taken thereupon to be contrary to the real Sense of the Assembly, and procured by Surprize, and therefore it is the King’s Pleasure, that so soon as the general Court is again assembled at the Time prescribed by the Charter, You should require of the House of Representatives, in his Majsty’s Name, to rescind the Resolution which gave Birth to the Circular Letter from the Speaker, and to declare their Disapprobation of, & Dissent to that rash and hasty Proceeding. The Secretary of State had come away from Bernard’s letters with the impression that a minority faction of the House had manipulated attendance and surprised fellow legislators to sneak the circular letter through. Bernard hadn’t really written that. From the radicals’ perspective, they had debated the letter at length, followed the chamber’s rules, and won a clear majority vote. Having demanded that the assembly retract the letter, Hillsborough then told Bernard what to do if it didn’t obey. His Majesty has the fullest Reliance upon the Affection of His good Subjects in the Massachusett’s Bay, and has observed with Satisfaction that Spirit of Decency and Love of Order which has discovered itself in the Conduct of the most considerable of It’s Inhabitants, and therefore His Majesty has the better Ground to hope that the Attempts made by a desperate Faction to disturb the public Tranquillity will be discountenanced, and that the Execution of the Measure recommended to You will not meet with any Difficulty. If it should, and if notwithstanding the apprehensions which may justly be entertained of the ill Consequence of a Continuance of this factious Spirit, which seems to have influenced the Resolutions of the Assembly at the Conclusion of the last Session, the new Assembly should refuse to comply with His Majesty’s reasonable Expectation; It is the King’s Pleasure that you should immediately dissolve them, & transmit to me, to be laid before His Majsty, an Account of their Proceedings thereupon, to the End that His Majesty may, if he thinks fit, lay the whole Matter before His Parliament, that such Provisions as shall be found necessary may be made to prevent for the future a Conduct of so extraordinary & unconstitutional a Nature. On that Day in the forenoon I sent a Message to the House (a Copy of which I inclose) together with a Copy of the 2nd 3d & 4th Paragraphs of your Lordships Letter. I did not send a Copy of the 5th & 6th Paragraphs; because I knew that the Faction would make Use of them to insinuate that the House was treated with Threats in the first Instance, before their Minds were known, and were not allowed Freedom of Debate concerning what was required of them. If I had sent no Extracts at all but incorporated the Substance of your Lordships Letter into my Message, they then would have called for the Letter itself and not proceeded ’till I had given a Copy of it. As it was, I steered this Business in the right Way. TOMORROW: How that went over. It’s hard to know exactly what happened when James Otis, Jr., Samuel Adams, and the rest of their committee presented the Massachusetts General Court with the first draft of a circular letter to other colonial assemblies on 21 Jan 1768. Legislative records were spare then, rarely reporting debates or vote counts, and in this case that record was altered. No pertinent diaries or letters survive from the politicians involved. One contemporaneous source, speaker of the house Thomas Cushing (shown here), supported the measure and spun the situation his way. Another, Gov. Francis Bernard, opposed the measure and also had to rely on secondhand reports. There is no Doubt but that the principal Design in forming this Remonstrance was to set an Example to the rest of America, & produce a general Clamour from evry other Assembly against the late Acts [the Townshend duties]. This was partly defeated by my refusing to call the Assembly before the usual time; & again by the House resolving to form their remonstrance in such a manner that it should not of necessity be made publick. But tho’ this last intention was quite inconsistent with the purpose of communicating the Substance of their remonstrance to the other Assemblies yet it did not discourage the party from attempting it. The House was accordingly moved that a day be assigned to take into consideration the propriety of informing the other Governments with their proceedings against the late Acts, that, if they thought fit; they might join therein. Upon the day this was strongly opposed & fully debated: it was said by the opposers of the Motion, that they would be considered at home as appointing another congress [like the Stamp Act Congress]; and perhaps the former was not yet forgot. Upon the close of the debate it was carried in the negative by at least 2 to 1. No one transaction in the House has given me so great hopes that they are returning to a right Sense of their Duty & their true intrest as this has done; and I hope it will make some attonement for their remonstrance. Cushing acknowledged that the measure failed to pass that day, adding that eighty-two legislators were present—about three-quarters of all representatives, not an unusually low number for a winter session. Something changed over the next two weeks, but I’m not sure what. The House continued to approve letters protesting the Townshend Act to British government figures: the Marquess of Rockingham (22 January), the Earl of Camden (29 January), and the Earl of Chatham (2 February). On 26 January “the Expediency of Writing Letters to the Houses of Representatives” was raised again and put off. Lots of other legislative work got done. Again, it’s not clear why there was a turnaround. The vote counts all appear to have been genuine. They didn’t come at the end of a session when members had started to leave. Gov. Bernard accused the opposition of “privately tampering with, & influencing particulars,” but that probably meant normal legislative lobbying and dealmaking. Neither he nor Hutchinson could point to anything more nefarious. A significant number of legislators must have decided that the circular letter wasn’t as problematic as they had thought three weeks before, or that the imperial situation was dire enough to require such drastic action. Whatever happened, the Massachusetts Circular Letter went out to the other colonies, and Gov. Bernard hurried a copy to London. TOMORROW: The Empire tries to strike back. The story of the Massachusetts Circular Letter of 1768 starts with the previous year’s session of the Massachusetts General Court. That provincial legislature was supposed to reconvene after its spring session on 2 Sept 1767. But that summer Parliament enacted the Townshend Act, a new way of raising revenue in the American colonies. Newspaper essayists protested the new law. Boston’s town meeting started talking about cutting imports. John Dickinson’s Letters from an American Farmer appeared. Gov. Francis Bernard delayed calling the legislature back into session as long as he could. But finally, with a border dispute with New York to be resolved, the governor reconvened the General Court on 30 December. That was “sooner than I intended,” he told his superior in London; “rather earlier than usual,” he told the legislators. Instead of taking up the border issue, the House proceeded to consider “the State of the Province” and its charter in relation to “divers Acts of Parliament”—meaning the Townshend Act. The House formed a committee to address those questions dominated by strong Whigs: speaker Thomas Cushing, clerk Samuel Adams, both James Otises, Joseph Hawley, John Hancock, Edward Sheaffe, Jerathmeel Bowers, and Samuel Dexter. Only then did the House turn to other matters. that if they should think proper to address his Majesty’s Secretary of State upon this occasion, it was my Official Business to take the charge of it & I should faithfully remitt it whatever the contents were. And if they put it into other hands, I should remonstrate against it as being irregular & unconstitutional for any addresses to pass from an Assembly (where the King has a representative presiding) to his Majesty either directly or indirectly, except thro’ the mediation of his Representative. By “other hands,” the governor meant Dennis DeBerdt, the new agent, or lobbyist, for the Massachusetts House in London. Bernard had tried to stop the House from hiring DeBerdt because he thought that a single chamber of the legislature shouldn’t have its own lobbyist, independent of the Council and himself. Naturally, the House committee responded by first drafting a letter to DeBerdt, which it presented to the whole chamber on 12 January. The principal authors of that document and the committee’s other productions appear to have been James Otis, Jr., and Samuel Adams, though it’s unclear how they collaborated. The representatives went through two days of intermittent debate. Bernard understood that “many Offencive passages were struck out.” But eventually the House approved that text and instructed Speaker Cushing to sign it on their behalf. On 15 January, that first letter finally done, the same committee proffered a similar missive to the Earl off Shelburne as Secretary of State for North America. Nobody knew that Shelburne had been dismissed from that post at the end of October. Five days later, the committee rolled out its biggest gun yet: a letter to King George III himself. The House approved that “humble Petition to the KING” after “divers Amendments.” All this time, Gov. Bernard was asking Cushing to see the letters. The speaker put him off, saying the chamber had voted not to make any copies until he was to sign the documents. On 21 January, the House took up yet another proposal from the committee: to send a circular letter on those issues to all the other North American legislatures. Circular letters were a standard bureaucratic tool; the London government sent them regularly to the royal governors. But legislatures were supposed to communicate upward to those governors and the Crown, not independently. And especially not to create a united front against one of Parliament’s laws. TOMORROW: Gov. Bernard stops the circular letter from circulating—for a while. This exploration of one aspect of the Battle of Bunker Hill grew out of a series of postings here from 2009, which I then rewrote as an article for the first Journal of the American Revolution print collection. With that book no longer available, we’re sharing the full essay online. But the best evidence shows, I argue, that Maj. Pitcairn wasn’t killed by a black soldier as that print depicted, or by any of the other nineteenth-century claimants. Whatever Salem Poor did to merit extraordinary praise from Massachusetts officers, and whatever Peter Salem did in his Continental Army service, neither man shot Pitcairn as he mounted the edge of the Breed’s Hill redoubt. This weekend I made my debut at Small State, Big History, an online journal devoted to the history of Rhode Island. My article, titled “Thomas Careless of the Royal Navy: Tried for Murder in Newport, Court-Martialed for Tossing a Block Islander,” grew from the series of Boston 1775 postings from May 2017 about how Midshipman Thomas Careless went on trial for killing Newport man Henry Sparker. This month has brought the sestercentennial of that trial. There are a couple of Boston connections to that Rhode Island story. First, the Boston Chronicle had the most detailed report on what led Careless to stab Sparker. Rhode Island newspapers withheld some information, ostensibly to protect the integrity of the trial but perhaps also to maintain the colony’s respectability. Second, the Royal Navy vessel on which Careless was serving, H.M.S. 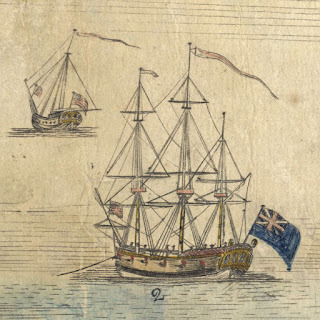 Senegal, was one of the warships that brought British troops to Boston in the fall of 1768. In fact, we discovered that the best period pictures of that ship were produced by Christian Remick and Paul Revere (as shown above) while the Senegal and the rest of that fleet lay in Boston harbor. The Small State, Big History article also contains another story about Thomas Careless that I hadn’t found when I wrote my 2017 postings. He returned to Rhode Island during the war—and got in trouble again! In connection with this article, I’m scheduled to appear on Bruce Newbury’s “Talk of the Town” show on WADK (1540 AM) in Newport on Monday morning shortly after 10:00 A.M. to talk about Sparker, Careless, and what their fatal encounter says about the American Revolution. 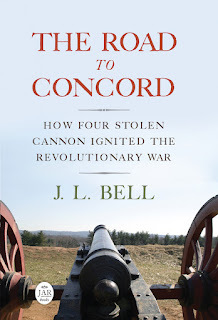 Small State, Big History comes from a team led by Christian M. McBurney, author of Spies in Revolutionary Rhode Island, Kidnapping the Enemy: The Special Operations to Capture Generals Charles Lee and Richard Prescott, and The Rhode Island Campaign: The First French and American Operation of the Revolutionary War, among other history books. Its weekly articles cover the whole range of the colony and state’s history, from founding to recent politics. With the sestercentennial of June 1768 passing by, I have few days to devote to the Battle of Bunker Hill. But here’s Charles E. Frye’s map of that battle, completed in 2011 and available through Wikipedia. It’s unusual in positioning American army units on the Charlestown peninsula. My wife suggested I help my oldest son with his 5th grade history project and that we could research to find out where [our ancestor] Isaac [Frye] was on the battlefield. Reading about the battle proved bewildering and disorienting. Therefore, my natural inclination was to make a map along with a timeline to organize that information. We started by mapping the Boston vicinity, including what was then known as the Charlestown Peninsula. Based on that and the major landmarks of the peninsula, we could then see the form of the battle and the sequence of events. My son hand-drew a one-page color map of the battle and wrote a short essay describing where Isaac most likely was located. We had narrowed it down to two possible locations. It took years before I finally located the documentation indicating which of the two was correct. I ended up making my own map using GIS and because I learned the Library of Congress’s map division had copies of most of the maps depicting the battle, and already had a map-scanning program. GIS allows for scanned maps to be positioned relative to modern geographic data, which then could be used to create a historical map in the GIS. I knew a cartographer working at the Library of Congress, so I contacted her, and their staff bumped up the remaining maps of the battle so I could have faster access. My map looked good to me, and it was rich with information. I shared it with the map division staff, and they liked it and cataloged a copy. However, the “Aha!” moment occurred for me two years later when I first visited the Bunker Hill Monument. There is a diorama there depicting the battle. Other than placement of the cannon, my map completely agreed with the diorama! How does a non-historian do that part-time in only a matter of months? With GIS of course. Mapping information in GIS forces rigor, which among other things affords efficiency because non-conforming information cannot be forced into database like it can be forced into a paragraph. I later published a data model and method for historians to use GIS in their work. I am happy to say many historians have since adopted, adapted, and expanded on that work. Here’s more on Frye’s data model and method for others to use with G.I.S. systems. taxation without representation, and thus the Townshend Act. a petition to King George III being turned away (because it wasn’t sent to London through the official channel). 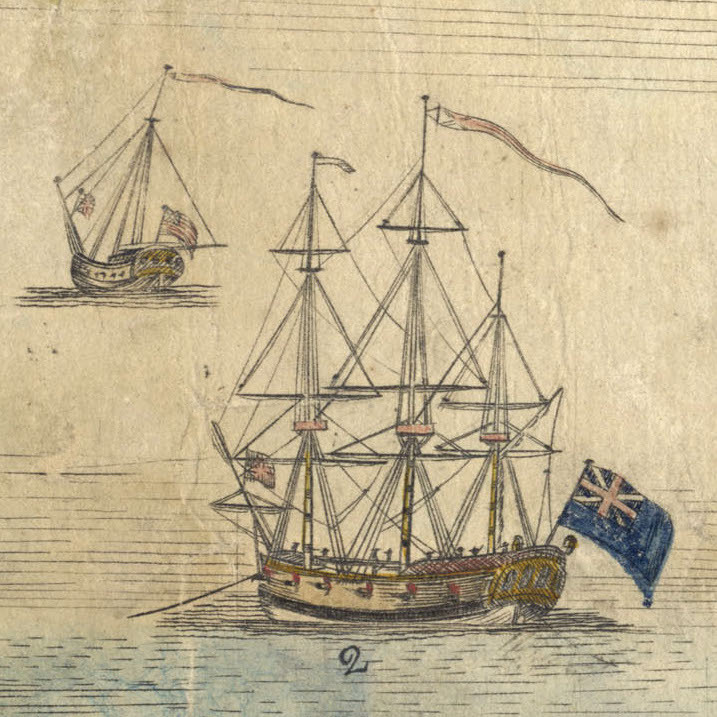 the Royal Navy’s impressment of sailors in Boston harbor. That document concluded with a wonderful bit of trolling, saying that “the Board of Customs have thought fit, of their own motion to relinquish the exercise of their Commission here.” In other words, the Customs Commissioners had left their posts in Boston—no acknowledgment that they had done so out of fear of mob violence. Therefore, the committee continued, there was no need for H.M.S. Romney to stay around in Boston harbor since there were no longer any Customs Commissioners to protect. Gov. Bernard shared wine with the gentlemen and promised them an answer the next day. His 15 June response was a collection of promises to do all he could, while noting that he could very little. “I shall not knowingly infringe any of your Rights and Privileges, but shall religeously maintain all those which are committed to me as a servant of the King,” he wrote. He couldn’t ignore Parliament’s laws, change a decision of the Privy Council, or give orders to the Royal Navy. But aside from all that, “I shall think myself most highly honoured, if I can be in the lowest degree an Instrument in preserving a perfect Conciliation between” Boston and the royal government in London. The town meeting thus didn’t achieve any of its goals. John Hancock’s sloop Liberty remained in royal custody. The Customs service continued to collect tariffs, even if top officials were working out of Castle William. 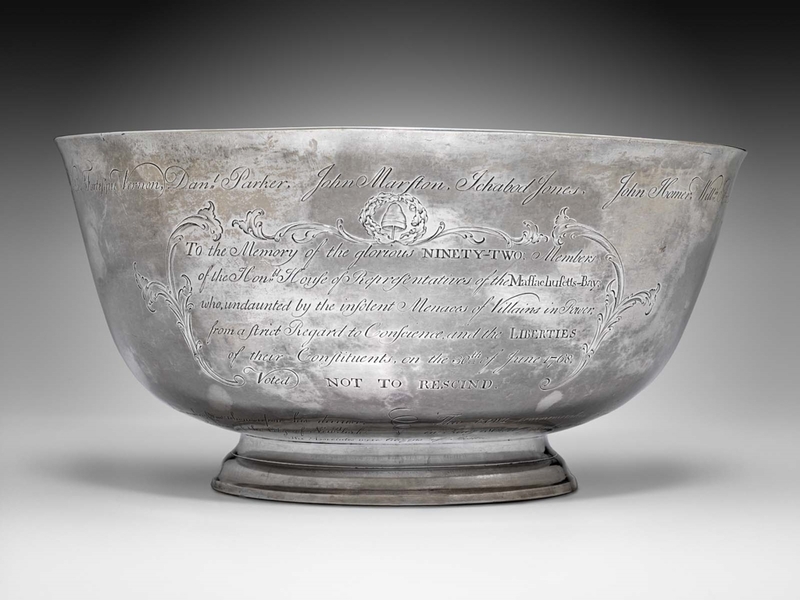 The Romney had already stopped drafting sailors because of the Liberty riot, and the governor had already promised the selectmen he’d speak informally to the warship’s captain. Nonetheless, the town’s formal and visible protest showed the people that the local political and mercantile establishment was pushing back, and that forestalled further violence. it is the King’s Pleasure, that so soon as the general Court is again assembled at the Time prescribed by the Charter, You should require of the House of Representatives, in his Majsty’s Name, to rescind the Resolution which gave Birth to the Circular Letter from the Speaker, and to declare their Disapprobation of, & Dissent to that rash and hasty Proceeding. . . .
Rescinding the “Circular Letter”—yet another political confrontation of June 1768! COMING UP: The “Circular Letter” comes home. The Liberty riot of 10 June 1768 wasn’t just about the seizure of John Hancock’s sloop for alleged Customs violations. It was also about how H.M.S. Romney, which helped in that seizure, had been impressing sailors in Boston harbor. Of course, it was a lot easier to threaten Customs officers than to threaten a 50-gun warship. By Sunday, Collector Joseph Harrison wrote, he was the only top Customs official in town, “all the rest having taken shelter either on board the Man of Warr or gone into the Country”—and he had stayed in bed for two days recovering from his injuries instead of venturing out. Boston’s Whig politicians were trying to calm the town—or at least to make it look calm. As in late 1765, when the Stamp Act riots both served the purposes of the elite and made them nervous, gentlemen sought a way to end the unrest before it harmed Boston’s reputation. Commissioners John Robinson, Henry Hulton, William Burch, and Charles Paxton were all on the Romney by Sunday. The second problem was that Hancock himself soured on the idea of compromise. I think he was waking to the instincts that would make him a very successful politician and an unsuccessful businessman. Getting the Liberty back would let him keep making money with it. Not getting it back would make him a political martyr, a hero of the waterfront. So the sloop remained anchored beside the warship, protected from rescue by its guns. some of the Leaders of the People had persuaded them in an Harangue to desist from further Outrages till Monday Evening, when the People are to be left to use their own Discretion, if their Requisitions are not complied with. Bernard gave permission for the Commissioners, Harrison and his family, and other Customs men to be admitted to the safety of Castle William. He called an emergency Council meeting for Monday morning. There were also some indecent Threats against the Governor, if he did not procure the release of the Sloop which was seized. Request all those, who in this time of oppression & distraction, wish well to, & would promote the peace, good order & security of the Town & Province, to assemble at Liberty Hall, under Liberty Tree, on Tuesday the 14th. instant, at Ten O’Clock forenoon precisely. On Tuesday, 14 June, “vast Numbers of the Inhabitants” gathered at Liberty Tree under the British flag. Since the weather was “wet and uncomfortable,” they moved to Faneuil Hall. Someone proposed making this gathering an official town meeting, so the selectmen sent out a summons to convene at 3:00. So many men arrived that the crowd moved on to the Old South Meeting-House. James Otis, Jr., presided over what the official minutes called “very cool and deliberate Debates upon the distressed Circumstances of the Town.” The meeting chose large committees to express Boston’s grievances—to present a petition to Gov. Bernard; to send a letter to Dennis Deberdt, the Massachusetts House’s lobbyist in London; and to draft a resolution protesting the Customs officers’ action. And then the first committee, again led by Otis, headed out to the governor’s house.